When Porsche unveiled their first 911 sports car 50 years ago, it was the beginning of the world’s most successful sports car ever. 2013 marks the anniversary of the company's most iconic car: the Porsche 911. And Porsche will celebrate in a big way by unveiling two sporty premieres on the Porsche stand in hall 1 of the 2013 Geneva Motor Show. 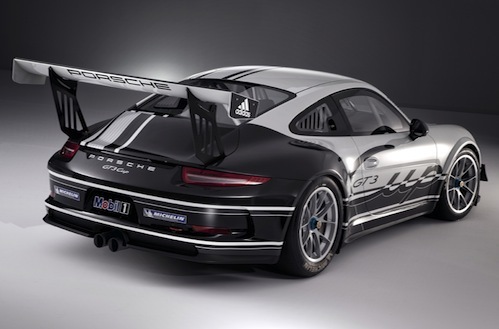 We know one of the new 911 sports cars will be the new 2014 Porsche 911 GT3 Cup. The 911 GT3 Cup is motorsports version of the future 911 GT3, and gives performance fans a preview of the high-performance Porsche 911 GT3 RS road production car. The Porsche 911 has for the last 50 years been equally at home on the racetrack as on the road, and when the 911 GT3 Cup makes its premiere in Geneva, it’s going to be exciting. Sports car fans will see the latest 911 model with new engineering highlights and the most powerful factory 911 on the planet. The 911 race car is based on the seventh generation of the sports car icon from Zuffenhausen. It’s been a popular car among sports enthusiasts and Porsche has produced 2,400 examples since 1998, making it the best-selling and most successful sports car in the world. The 911 GT3 Cup's driving dynamics and driving excitement are at an even higher level than before. The new 2014 Porsche 911 GT3 Cup is motivated by a 3.8-liter six-cylinder engine that produces 460 horsepower which is a 10 horsepower increase from the previous model. Everything about the new 2013 Porsche 911 GT3 Cup points to greater performance and driver involvement. The high-performance 911 GT3 Cup race car uses Michelin race slicks that have been increased to 10.63 inches at the front and the rear now measure 12.20 inches. It will also receive an upgrade to the performance brakes. The 15-inch slotted and inner-vented steel brake rotors at the front axle are decelerated by six-piston aluminum fixed calipers, and the rear features a four-piston version. Another feature newly designed by Porsche Motorsport, are the single piece center mount race wheels. The 3.8-liter powerplant comes mated to a six-speed “dog-type” gearbox developed by Porsche Motorsport which is operated via shift paddles. This is the first time Porsche has used the new transmission in their brand trophy race car. The new 911 GT3 Cup will be run exclusively in the Porsche Mobil 1 Supercup next year. The Porsche 911 GT3 Cup will be produced in Stuttgart-Zuffenhausen on the same assembly line as the street-legal production versions. The base price for the high-performance race car is 181,200 Euro ‘s ($234,219 U.S.) The new 2014 Porsche 911 GT3 Cup gives performance fans a good idea of what the future Porsche 911 GT3 RS will look like. Watch the Porsche 911 GT3 Cup character refinement video below.